Crashed on finals to runway 15 when it hit a hill and then plunged across a 200 foot culvert between the hill and the airport before slamming into Shale Bluff, broke up and caught fire. PROBABLE CAUSE: "The flight crew's operation of the airplane below the minimum descent altitude without an appropriate visual reference for the runway. 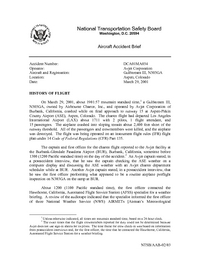 Contributing to the cause of the accident were the Federal Aviation Administration's (FAA) unclear wording of the March 27, 2001, Notice to Airmen regarding the nighttime restriction for the VOR/DME-C approach to the airport and the FAA's failure to communicate this restriction to the Aspen tower; the inability of the flight crew to adequately see the mountainous terrain because of the darkness and the weather conditions; and the pressure on the captain to land from the charter customer and because of the airplane's delayed departure and the airport's nighttime landing restriction. " Distance from Los Angeles International Airport, CA to Aspen Airport, CO as the crow flies is 1177 km (735 miles).